As discussed in our previous article, positive reinforcement involves adding a pleasurable thing following a behaviour, making this behaviour more likely to be repeated in the future. What this pleasurable thing might be depends on a variety of factors such as individual preferences and species – humans are a very verbal species therefore verbal praise alone often motivate our behaviour. However, this is not the case with horses and verbal praise alone is not an effective form of positive reinforcement. While many of us would like to think of the occasional “good boy” is an effective reward, it won’t alone motivate the horse to repeat the behaviour preceding “good boy” – not anymore than handing him a £10 note. While humans and horses both learn the same way, they don’t necessarily have the same interests. So what can we use to positively reinforce our horses behaviours? The most efficient positive reinforcer (pleasurable thing) is food. 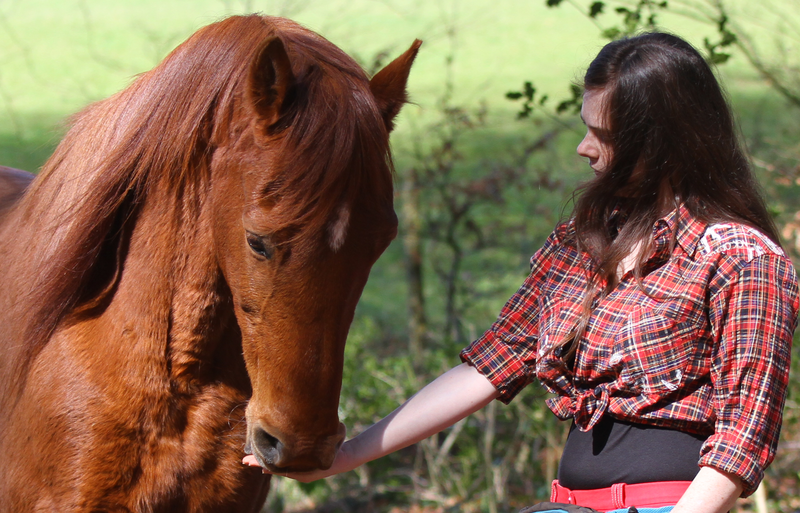 Unfortunately many equestrians are hesitant to use food rewards in training due to the myths and horror stories surrounding hand feeding – the most popular claim is that ‘feeding treats teaches horses to bite’. 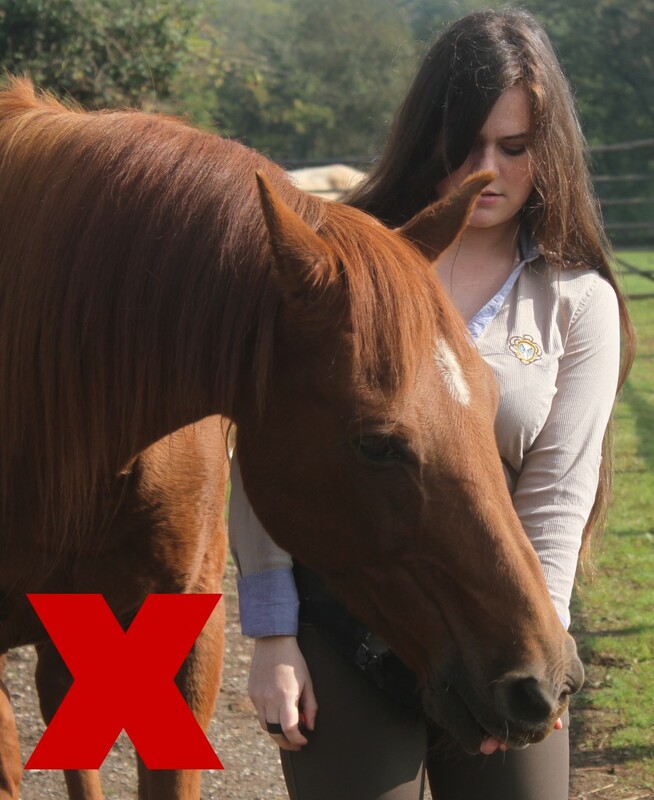 Yet in 2010, researchers investigated unwanted oral investigative behaviour in horses during hand feeding and found that while 91% of horses will display oral investigative behaviours (such as licking) none of the horses would bite or nip. Nipping and biting behaviours originate from an entire difference source to hand feeding. Beside let’s face it, if trainers can use food reinforcers to train lions, hippos and orcas it cannot be that dangerous as long as done properly! An example of poor food delivery that if repeated several times is likely to lead to the horse over-crowding the trainer and engage in unwanted oral behaviours. 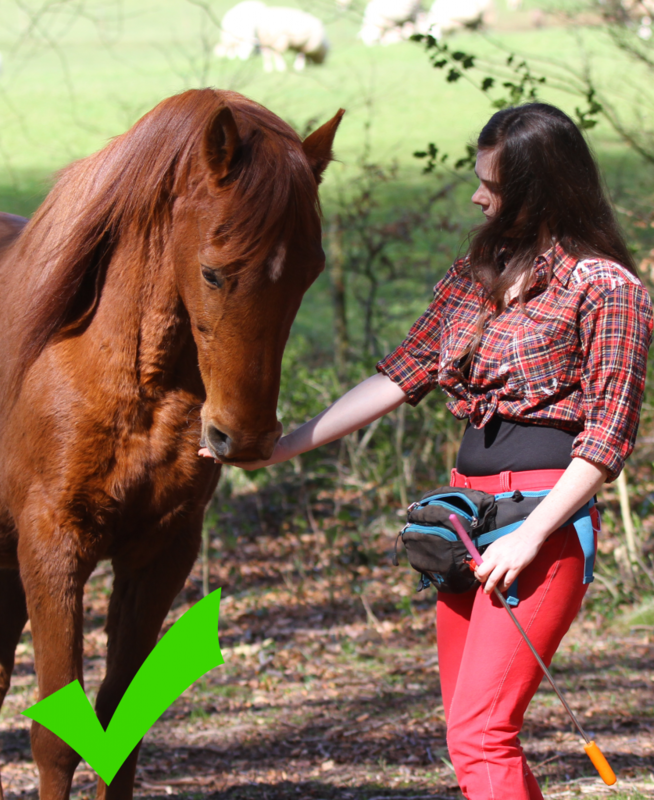 The trainer is feeding too close to her body, encouraging the horse to eat near her bum bag and to stand crooked. There are a few simple rules to follow when giving food to your horse, whether you are interesting in getting started with positive reinforcement based training or simply want to give your horse’s his feed or the occasional treat safely. Don’t reinforce what you don’t like. It is natural for a horse to sniff, lick and come close to you when you are holding food – this is natural explorative and foraging behaviour. And while it should not be punished by tapping or pushing the horse, it should not be reinforced either. Therefore the first rule when giving food to your horse is to never follow unwanted behaviour (such as overcrowding), with food. If you do this, you are positively reinforced an unwanted behaviour. Instead reinforce what you like. If you are standing there with a carrot in your pocket and your horse is overcrowding, sniffing you or pawing the floor, wait. Wait and you will see that at one point or another (and that’s not as long as you think) your horse will move his head away from you or stop pawing. Here! This is what you reinforce; give him his carrot while he is standing with his head forward rather than when he is all over you. If you remain consistent and only ever give your horse the food when he is doing something you like (stand still and forward) rather than when he is doing something you don’t like (attempting to mug you), you will see less of what you don’t like and more of what you do like. Feed where you want your horse to be. 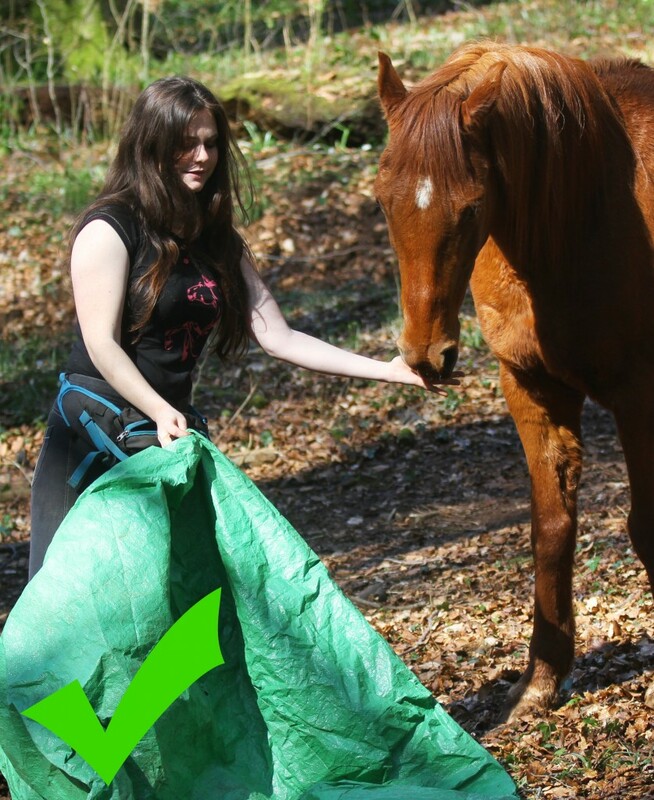 An example of good food delivery, the trainer is extending her arm, feeding away from her body, underneath the horse chin promoting good posture. She doesn’t hesitate to move closer to the horse to feed him rather than encouraging the horse to go to her for the food. Many time people are good at taking the piece of carrot out of their pocket when the horse is no longer exhibiting unwanted behaviours, but then they proceed to feed the horse near their body or pocket. Instead I recommend to ‘feed where you want your horse to be’. If you are hand-feeding, make sure to extend your arm away from your body and to present the food underneath the horse nose in such a way that he remains in the desired position; straight from head to tail with all four feet on the floor. This work for more than just hand-feeding but for feeding in general. At my yard, we have two ponies that stay out all year round, one of which has gotten in the habit of standing at the gate and barging out when anyone come to pick their horses up in the evening or put them in the morning. Most of the time when the pony escapes someone ends up feeding her, which of course motivates the behaviour. I started attaching haynets up for her and my pony (the second pony in the field) late at night and early in the morning, always at the same spot: away from the gate but still in the field. After a week or so of the same routine, I noticed that every night and early morning the ponies would go stand away from the gate at the spot I fed them. No miracle here, just the simple use of positive reinforcement. Use protected contact when first getting started. A good food delivery, this time from the side. Again the trainer extend her arm away from her body and deliver the food underneath the horse nose. This last point is especially important when introducing hand feeding to a horse that initially has ‘poor food manners’ – I say manners loosely, as of course, the horse is not being rude purposefully. Protected contact consists of separating the trainer and the animal by a fence, gate or stable door. This reduces the risks of the trainer being overcrowded to the point where he is tempted to use punishment and by setting the horse up for success, there is less room for errors. For example, the horse cannot circle around the trainer in an attempt to get to the treats, so standing nicely and forward is easier to achieve. Of course this is a temporary tool that can be removed once both horse and trainer have gained confidence in their skills. I am hoping this article will have put to rest some or all of your concerns regarding hand feeding, and gives you helpful tips on doing so in a safe way. Join me again next month, where will look at why and how to teach horses to nose target with positive reinforcement. Fairhorsemanship (FH) is a humane, science-based horse training method created by French horse trainer Alizé V.Muckensturm. FH is dedicated to promote non-coercive training methods, to reduce the use of aversive tools and methods in handling and training horses, and to promote appropriate horse management.